First and foremost, decide where you are going to throw the party. It can be your home, nearby party hall or any other choice you may have. Once you decide the venue for your party, it’s easier to lay out a plan and pull things together. Now that you have decided to throw a Rainbow Themed Birthday Party, make sure everything from invitations to party decorations are well suited for our chosen theme. You may choose to design your own invitation cards or order personalized invitations online. Let the guests take cues from your invitations and be ready to join the party with an explosion of colors! Decorate the party space with rainbow cut-outs, multicolored paper ribbons, balloons and confetti. Stack up enough of rainbow themed or multicolored paper plates, paper cups, spoons and forks. A rainbow themed birthday cake can work wonders. Oh! don’t forget to include yummy snacks and drinks. You can get a sneak peek on how sweet rainbow kabobs are made from Teach Mama. Kids would love to play some games at the party with all their little guests. Colored candy sorting games or beading games are sure to bring about giggles and smiles. If you are planning to incorporate fun activities for kids, here are some ways you can plan your rainbow themed art & craft. Arrange a table with lots of coloring pages, crayons, coloring pencils and water color kits. Kids can help themselves to make their choice. Similar way, add some craft supplies like multicolored play-doh kits, loom bands and craft papers to the mix. You may need to assist them while crafting. Get more insights from Pink and Green Mama, Alison’s No Time for FlashCards and Play Dr Mom to organize more fun art & craft activities. Carefully choose the party supplies and return gifts to suit the rainbow theme. If you have enough space and budget, you may opt in for a rainbow bouncer or a rainbow piñata and let the kids have a blast! 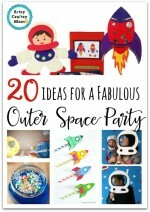 Use your imagination to find some super cool ideas for unique party supplies and return gifts. It will be a great idea to arrange return gifts like colored candy, rainbow cupcakes, stickers, loom bands, rainbow school supplies like pencils, erasers, sharpeners or anything rainbow colored in a personalized goody bag for each little guest. Checkout Karas party blog for a cute little party bag and more ideas. Here are some items that you can buy from amazon.com. This section contains affiliate links. 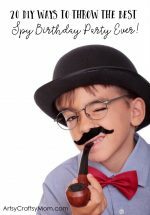 Birthday Party Themes – A Spy Agent Party for an 8 year old..